Kumar Sangakkara today stepped down as captain of Sri Lanka's ODI and T20 teams three days after his side's defeat to India in the final of the World Cup. He has, however, offered to continue to lead the Test side on an interim basis for the upcoming series against England and Australia "if this is considered helpful for the new captain". It has been an unbelievable past week for the entire nation. The frenzy that has engulfed the country is hard to get away from. In walks Praveen Kumar, the man from Meerut who had his date with destiny cut short by injury. He was part of the initial 15-man World Cup squad, but an elbow injury ruled him out. Pakistani cricket captain Shahid Afridi went on the backfoot Tuesday, saying his comments on Indians not being as large hearted as their neighbours were misquoted by sections of the media. M S Dhoni, the captain of the 'Men in Blue', will now don the olive greens of the Indian Army as he is being given the honorary rank of an officer as a token of appreciation for his World Cup achievement. Dashing Indian opener Virender Sehwag today said that his assault on Pakistan paceman Umar Gul during the high-voltage World Cup semifinal clash was pre-planned with a view to send their arch-rivals on the backfoot. Gul, Pakistan's best bowler till the Indo-Pak clash, was sent to the cleaners by Sehwag as he plundered him for 21 runs in his second over. Enraged by the ICC’s decision to cut the number of teams in the 2015 World Cup to 10, the Irish cricket authorities and captain William Porterfield said the move is an “absolute disgrace” and damaging to the game. The ICC cut the number of teams at the 2015 World Cup from 14 to 10 yesterday, dealing a blow to teams such as Ireland, Holland and Canada as they would not have a chance to qualify for the event. A qualification process will, however, be held for the 2019 edition. Still enveloped in the ecstasy of the World Cup victory, off-spinner Harbhajan Singh today emphasised that ace cricketer Sachin Tendulkar should be awarded with the ‘Bharat Ratna’. Bhajji said that not only he but the entire country wanted Tendulkar to get this honour. “This is the time to award the ‘Bharat Ratna’ to the God of cricket Sachin Tendulkar, who has put in 21 years in his career in cricket. All Indians love him for his superb contribution and it is everybody’s wish that he gets this award,” Bhajji said while interacting with the media here today. Golfer Shiv Kapur has withdrawn from the inaugural Panasonic Open, part of the Asian Tour, which will be held at the Delhi Golf Course from April 6 to 9. Kapur finished in third place at the Indian Open which was held at the Delhi Golf Course in December 2010. Kapur, a regular on the European Tour, had been tied in third position at the recently concluded Trophée Hassan II in Morocco, before slipping back on the final day. New Zealand's Daniel Vettori was today named captain of Royal Challengers Bangalore (RCB) for the fourth edition of the Indian Premier League, starting April 8 in Chennai. 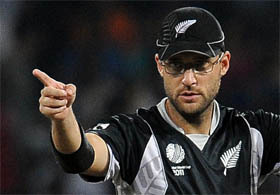 Vettori, who led New Zealand to a record sixth semi-final apperance in the just-concluded World Cup, will replace spin legend Anil Kumble who captained the team in the last two seasons of the Twenty20 league. Kumble will also be a part of the Bangalore franchise as a chief mentor. Winners of the inaugural season of IPL, today in Jaipur launched their team’s new jersey and welcomed Floriana Group as team sponsor and HDFC Life as the principal associate team sponsor for IPL4. Shilpa Shetty Kundra, the co-owner of Rajasthan Royals, unveiled the jersey and presented it to the sponsors Sanjay Jain, Chairman, Floriana and Sanjay Tripathi, EVP and head - Marketing and Direct Sales, HDFC life. "I would like to announce that after careful consideration I have concluded that it is in the best long-term interests of the team that I step down now as national captain so that a new leader can be properly groomed for the 2015 World Cup in Australia," a statement from Sangakkara said. "This was a decision I made prior to the 2011 World Cup. I will be 37 by the next World Cup and I cannot therefore be sure of my place in the team. 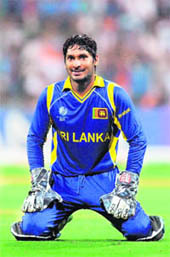 It is better that Sri Lanka is now led by a player who will be at the peak of his career during that tournament." Thilan Samaraweera is likely to be named Sangakkara's successor for the Test side, while Tillakaratne Dilshan and Angelo Mathews are discussed as options to take charge of the ODI and T20 sides. 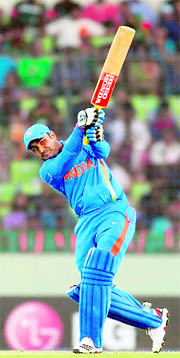 The 33-year-old left-hander, however, is keen to continue playing in all formats of the game for the next few years. "I have no plans of retirement from international cricket at this stage and subject to form and fitness I would like to be considered for selection in all three formats of the game for the foreseeable future." Sangakkara, who scored 48 in the title clash of the World Cup, finished the tournament with 465 runs at an average of 93. "It has been a true honour and a great privilege to serve my country as captain during the past two years and, although bitterly disappointed that we could not win the final, I am very proud of the performances of the team. “I met with the selectors on Monday and I explained my reasons for my decision and I assured them of my fullest support in helping our new captain settle into the leadership. In this regard, I have offered to continue as the Test captain for the forthcoming series with England and possibly Australia if the selectors believe this would help the new captain and aid the transition,” he added. Hyderabad: Sri Lanka skipper Kumar Sangakkara will lead the Deccan Chargers in the fourth edition of the Indian Premier League, it was announced here today. Australian cricketer Cameron White will be Sangakkara's deputy in the Twenty20 tournament, beginning April 8. It has been an unbelievable past week for the entire nation. The frenzy that has engulfed the country is hard to get away from. 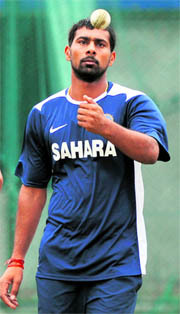 In walks Praveen Kumar, the man from Meerut who had his date with destiny cut short by injury. He was part of the initial 15-man World Cup squad, but an elbow injury ruled him out. Now, the man is back in action and all ready to play for the Kings XI Punjab in the fourth edition of the Indian Premier League. "First of all, I want to congratulate the Indian team and the people for winning the World Cup. I have been playing cricket for a while. It is a shame that media has hyped up the issue. I have never discriminated between a Hindu or a Muslim. It is all equal in our religion. My comments were misquoted by the media," Afridi said. The skipper sparked a controversy saying "Indians are not as large hearted as Pakistanis or Muslims and it is very difficult to improve the relations between the two countries". After a furore, Afridi sought to play down the issue. "What I really meant was when the Indian team came to Pakistan last time, the people here showed a big heart. So the same way it should happen in India whenever we go there. That is all I meant. It is important to have good relations with our neighbours," he said. Afridi went on to add that playing in India is something he has enjoyed the most in his career. "Whenever we go to India, we participate in the charity programmes. I have a played a lot in India. We get a lot of love there. The cricketers there are valued even more than Pakistan. Playing in India is something I have enjoyed the most in my 14-year-old career," he said. The dashing all-rounder, however, slammed the media on both sides of the border. "The media was disappointing when I came to Mohali. The media should talk about peace. We can't have much expectations from the politicians. People to people contact can only improve the relations. Dhoni was invited by Army Chief General V K Singh this evening for tea at his residence where he was given the offer, which he accepted, Army officials said here. He was offered the honorary rank of an officer in the Territorial Army, they said, adding the rank to be given to him would be decided later. During his interaction with the Army Chief, Dhoni said he had always wanted to join the Army and he had many friends in the Service. That assault demoralised the pacer, who conceded 69 runs from eight overs in the match and India posted 260 for nine which turned out to be match-winning score. "We were really charged up against the match in Pakistan. I said I will take on Umar Gul. If I score a couple of boundaries off him, Pakistan will be on the backfoot and that exactly happened in the match," Sehwag said. He said the players took the Pakistan match at Mohali just like a final. "The match against Pakistan was the final for us. We thought that if we win this one, it will be easier to beat Sri Lanka in the final as we had beaten them many times recently in India and Sri Lanka," he said. Sehwag said he was happy that Sachin Tendulkar has now become a World Cup-winner, a trophy which had eluded him for long in his illustrious career. “It’s an absolute disgrace and I don’t know how they can even comprehend doing this. We have done everything they asked of us over the last few years in terms of restructuring Irish cricket and I can’t come to terms with how they can just shut us out, do away with the qualification period and then try and call this a World Cup,” Porterfield was quoted as saying in the media here. “We are currently ranked 10th, ahead of Zimbabwe, and there is no reason why we can’t move up another position, if not two, by the next World Cup. Instead, the door has been closed in our face. It is an embarrassment. I don’t know what else we had to do in the World Cup, we held our own against the full members, we beat England, we got the fastest ever hundred. For them to turn around and throw that back in our face a few weeks later is an absolute joke,” he fumed. 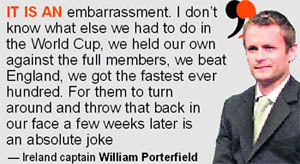 Porterfield also ridiculed the logic that expanding the World Twenty20 Championships to 16 teams would be of any consolation to the associates. “To come out and try to cover things up by saying there are going to be 16 teams at the World Twenty20 is ridiculous,” Porterfield said. “They say it’s a compensation but I can’t agree with that because it is every player’s dream to play at and win a World Cup. Everyone in the cricketing world can see they are shutting the door on not only a lot of players, but also on the development of world cricket. It’s not just about Ireland. This could mean the death of cricket in a lot of countries...and all because a few full members are looking to make a few extra quid from the competitions,” he added. Cricket Ireland chief executive Warren Deutrom said he was left outraged by the ICC’s decision. “We’re outraged by the decision today. We’re not taking it lying down. It’s a betrayal of sporting principles and it flies in the face of all the evidence we saw at the World Cup, which was that an associate nation could compete with the best teams in the world,” he said. Still enveloped in the ecstasy of the World Cup victory, off-spinner Harbhajan Singh today emphasised that ace cricketer Sachin Tendulkar should be awarded with the ‘Bharat Ratna’. Bhajji said that not only he but the entire country wanted Tendulkar to get this honour. “This is the time to award the ‘Bharat Ratna’ to the God of cricket Sachin Tendulkar, who has put in 21 years in his career in cricket. All Indians love him for his superb contribution and it is everybody’s wish that he gets this award,” Bhajji said while interacting with the media here today. He added that current skipper Mahendra Singh Dhoni was one of the finest that Team India ever had. “Apart from being a powerful leader, he is a great guy. His leadership qualities are simply amazing and so are his captaincy skills,” he added. "We are very excited for the upcoming season. Vettori is a highly experienced and respected leader and we hope to ride to the pinnacle of success this IPL under his leadership," RCB chairman Vijay Mallya said in a statement.